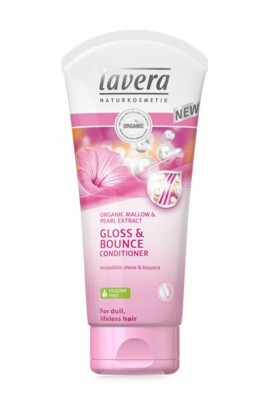 The Lavera Glow & Bounce Conditioner is gluten-free and leaves your hair shiny and supple ! The formulation with organic mallow and pearl extract naturally cares for dull hair, achieving radiant results and tangle-free hair. With Lavera Natural Hair Conditioner for Dull & Lifeless hair, your hair are immediately easier to comb ! Super après-shampoing, fait des cheveux très doux, et odeur à tomber ! Lavera Vegan Conditioner for Dull & Lifeless hair makes your hair easy to brush ! After applying Lavera Gloss & Bounce Shampoo, massage a walnut-sized of Lavera Hair Conditioner amount into freshly washed hair using your fingertips, leave for 2 to 3 minutes then rinse thoroughly. Silicone-free : Lavera Natural Hair Conditioner durably takes care of your hair !